Ellen (Bunzey) Fichtelman is a native of Lincoln County, North Carolina. She graduated from North Lincoln High School in 2008 where she was class president, a top-ten student, and a varsity athlete. Ellen concentrates her practice in Residential Real Estate, Wills, and Estates. She received her undergraduate degree in English Literature (B.A., 2012) from Davidson College, where she was a member of the Pre-Law Society and on the College’s club swim team. She received her law degree (J.D., 2015) from Stetson University College of Law in St. Petersburg, Florida. While in law school, Ellen interned with the Civil Division of the United States Attorney’s Office in Tampa, Florida. She also interned with the Community Law Program in St. Petersburg, Florida, a non-profit organization that serves the legal needs of low-income and disadvantages individuals. 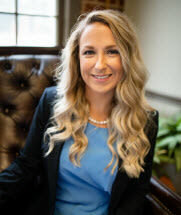 In her final year of law school Ellen served as a Certified Legal Intern for the Office of the State Attorney, Sixth Judicial Circuit of Florida, Dependency Division, where she worked directly with a State Attorney trying child welfare cases. That same year Ellen published “The Double Entendre of Juvenile Prostitution: Victim versus Delinquent and the Necessity of State Uniformity” in the Juvenile and Family Court Journal (Volume 65:3 September 2014). In her final year at Stetson, Ellen was elected president of The Florida Association for Women Lawyers at Stetson (FAWLS). During her presidency, FAWLS was awarded Student Chapter of the Year (a statewide award) and she was the recipient of Stetson’s Student Organization Officer of the Year Award. Ellen was also awarded Stetson University’s William F. Blews Pro Bono Service Award. Ellen is a member of North Carolina Bar and Lincoln County Bar. She currently serves as the Vice President for NC District 27B. Additionally, she is an active member of the Denver- Lake Norman Rotary Club and currently serves on the Public Relations Committee. Ellen balances the practice of law with spending time on Lake Norman; Davidson College basketball and Carolina Panthers games; and hiking in the NC mountains. She and her husband, Jim, reside in Denver with their two (giant) Great Pyrenees.